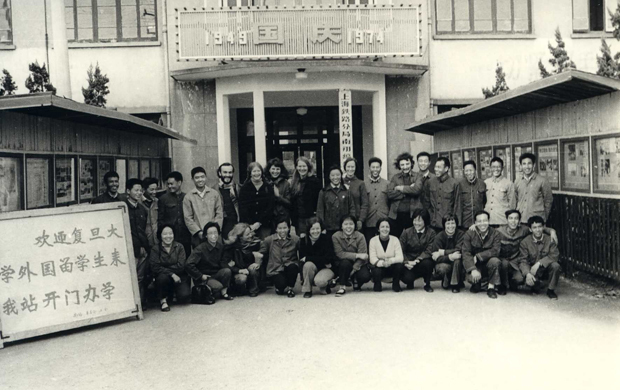 A group of Chinese and British students, including Isabel Hilton, pose for a photograph at Fudan University in the 1970s. This week, Kaiser and Jeremy are pleased to be joined by Isabel Hilton, a longstanding British journalist whose youthful interest in China got her blacklisted by the British security services and the British Broadcasting Corporation and redirected her into a career in journalism in Latin America and China, where she has covered the country for publications including the Daily Express, The Sunday Times, The Independent, and The Guardian, among others. In addition to talking about what China was like for a junior reporter back in the 1980s, we move on to talk about Daniel Ortega and the Falklands Wars, Christopher Hitchens, Richard Gere, water and air pollution, and of course Isabel’s work promoting greater knowledge of China abroad, formerly as Editor of openDemocracy and now as Editor of chinadialogue, one of the most longstanding bilingual journals online.